Who's ready to find out who won the My Memories Suite Software Giveaway?! I hope this person has some ideas in their head for ways to use all the fantastic kits in the My Memories store! 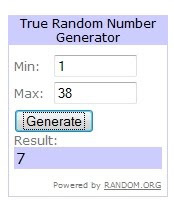 Number 7- do you know who you are?! Shoot me an email to claim your prize and I will get you all the information you need to download your software. to receive $10 off the $39.97 purchase price of the software. Yeah!! Thanks for a great giveaway! I'm super excited to get started with my software! !